In 2010, I composed a simple melody for Guru Arjan's shabad Charan Kamal Prabh Kay Nit Dhiyaoon, Guru Arjan Dev's shabad focused on continual remembrance of the scented path of the Beloved. The composition was made in raag Bilawal in such a way that the chords repeat in a 4-bar cycle. That way the music meditates while the singer sings every line of the shabad. Many of the melodic elements are also repeated throughout the shabad. Even when we are singing different words, in different melodies, there is a continuity in the music, a humble attempt to depict melody and music losing their own ego. Bilawal is a raag which uses all "shudha" notes, and is designed to evoke feelings of remembrance of love, the remembrance of one's spiritual guru. Guru Arjan Dev reminds us in the shabad, "let me never ever forget you." 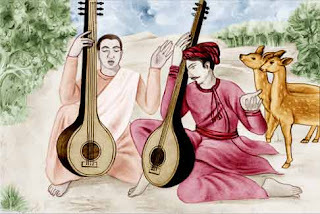 Most of the popular compositions in this raag are in an alternative form of the raag called, Alhaiya Bilwal, which uses both Ni's in addition to all shuddha notes. This composition is truer to the older and more stricter interpretation of the notes of the raag. But there is one important difference and nuance ... While the raag is uttarang, much of the melody of the shabad is poorvang; this was intentionally done to create a sense of continuity desired by the words of the shabad. I meditate continually on the lotus feet of love. What wisdom will lead me to attain my love? What blessed destiny will lead me to meet my love? Each and every moment meditate on love. That I may never ever forget you. (1) Learn more about Janapriya's music at https://www.patreon.com/janapriya and watch his other videos at https://www.youtube.com/channel/UCf4pvyOdaljpTW7NUgOWO4A.